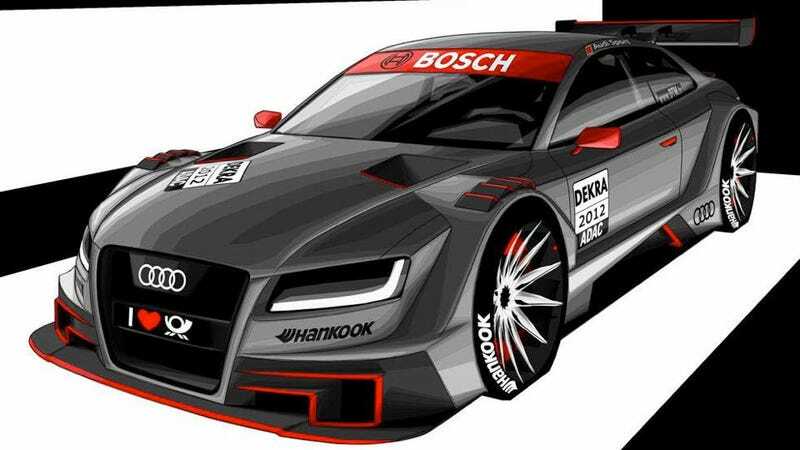 While the BMW DTM racing concept's apparently mated with pure evil, the Audi it'll be racing against in 2012 has been mated not so much with evil as with, say, stoic purposefulness. Not quite headline copy, but definitely promising. The cars, which will compete in the 2012 Deutsche Tourenwagen Masters, Germany's top touring car series. Audi's entry — dubbed R17 internally — is based on the A5 coupe. Like BMW 3-Series-based entry, the Audi's built on a carbon fiber monocoque. The racecar's 460 hp arrives by V8 engine and six-speed sequential transmission. Audi's won the DTM title four times since 2004, though lost to Mercedes-Benz in 2005, 2006 and 2010. The coming-out party for both DTM racecars will be held at the Frankfurt motor show this September.